Last night in Seattle, Kjell and I were awarded the American Statistical Association's Ziegel Award for the best book reviewed in Technometrics during 2014. 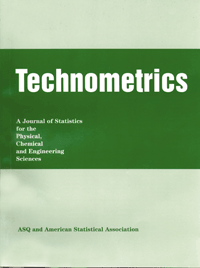 Technometrics is the journal for the Physical, Chemical, and Engineering Sciences published by the American Statistical Association. It was quite an honor and we would like to thank Ejaz Ahmed (the Review Editor) and David Steinberg (the Chair of the Management committee). I love that the award certificate has the famous green color from the journal cover. When I lived in Virginia, I used to get teased about bringing that "weird colored journal thingy" to the Outer Banks to read on vacation. In sadder APM news, Hannah Bracken is leaving Springer. She was invaluable during the process of writing the book as well as after the release. While it is sad news for us, she is going to school in Paris. It is probably more accurate to label us as "jealous". We wish her the best! August 12, 2015 by Max Kuhn.